and not just any garbage, but more specifically, plastic. The average American produces 4.4 pounds of trash daily. Plastic is defined as any synthetic or semisynthetic material made from an organic polymer. Common types of plastic are polypropylene, polystyrene, polyethylene, polyvinyl chloride…the list goes on. The main ingredient in any plastic is hydrocarbon (that’s what the organic polymer is). The hydrocarbon is sourced from natural gas or oil, which are fossil fuels. Fossil fuels are the result of organic matter, things like plants and animals, being condensed by the weight of the Earth over millions of years. They very slowly turn into oil, as well as natural gas (a byproduct), which sits right on top of the oil. In order to access these resources, humans tap into oil reserves both on land and sea, through a variety of different methods, although most commonly by drilling deep under the Earth’s surface and extracting oil through wells. Once these limited resources are siphoned from the Earth, they are transported to plastic manufacturers. The manufacturers combine the fossil fuels with other ingredients in order to create tiny plastic pellets, called ‘nurdles’. These little pieces are then used to create everything and anything. Melted down into a liquid state, they can be molded into every shape imaginable- forks, cartons, caps, tupperware, toothbrushes, waterbottles, lipstick, twist-ties, confetti… you name it. Wait… What makes it so bad? 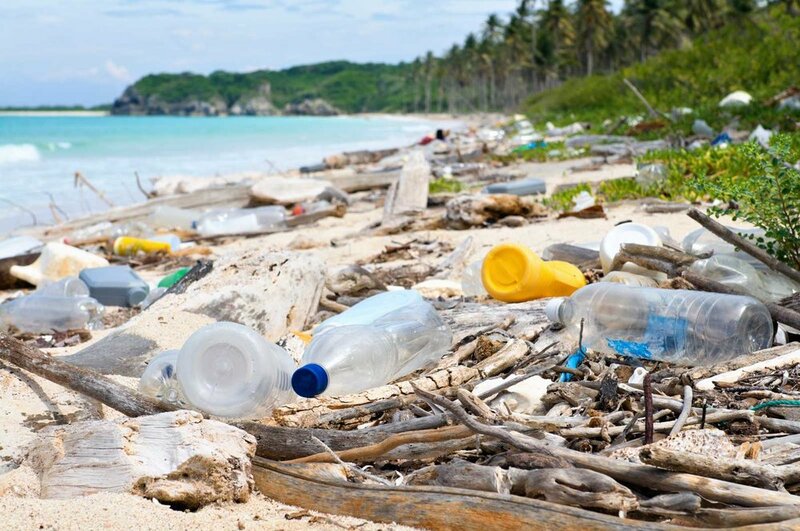 It may seem dumb, but it’s really important to understand exactly why plastic is a problem. As you can see, the production of plastic is unsustainable. We all know that fossil fuels are a limited resource, and that their use results in an extreme, unnatural amount of greenhouse gas being released into our atmosphere. Gases such as carbon dioxide, methane, nitrous oxide and ozone are being trapped in our atmosphere, causing global warming. When sunlight shines onto the Earth, it’s radiation is absorbed as heat, and releases back into the atmosphere. The greenhouse gases trap this heat, which over time, accumulates significantly, because the more greenhouse gases there are, the more heat gets trapped. This global warming causes different effects all over the world. Glaciers are melting, sea levels are rising, weather events are becoming far more extreme, and animals are having a difficult time keeping up. A major part of the problem is our single-use mindset. We produce plastic with the intention that it will be used once or maybe a couple of times, and then we throw it in the landfill, to sit for hundreds and hundreds of years. When plastic, along with all other garbage, sits in the landfill, it produces and emits even more greenhouse gases. However, most plastic never even makes it to the landfill. Only 9% is recycled. The remaining 91% goes to the landfill, or worse, it winds up in the ocean. Every minute, approximately one garbage truck of plastic is dumped into the ocean. Not only does this plastic make our beaches polluted and less appealing, but it harms marine life. Animals are strangled and poisoned, caught in nets or bags, suffocated by our consumerism. They mistake tiny bits of plastic- called micro plastic- for food. Whales, dolphins, seals, turtles, birds, and every kind of fish consume unimaginable amounts of plastic. Of course, they can’t digest it, and it winds up filling up their stomachs so they can’t eat any real food. Of course, many people don’t even consider that what goes into those animals also naturally goes into humans. About 3 billion people around the world rely on seafood for survival. It doesn’t take a genius to figure out that the same plastic ingested by fish winds up in the human digestive system via the food chain. To be clear, not all plastic is horrible. Some plastic can be useful- things like TV remotes and hospital supplies, for example. The main problem is disposable, single-use plastic. The stuff that’s meant to be used for 10 or 15 minutes, then thrown away. Plastic forks. Chip bags. Straws. Toothbrushes. Shampoo bottles. Balloons. Ziplock bags. Clothing tags. Berry cartons. Water bottles….. you get the idea. Our consumerism habits are driven by the idea that we can just throw things “away”. But the reality is that nothing really ever goes away. We just relocate it to nature, somewhere where we can’t see it. One day soon, all of this will catch up with us. But it doesn’t have to. Humans are the problem, but we are also the solution. It’s up to you to decide which side you’re on. Only 9% of all plastic is ever recycled. The remaining 91% goes into the landfill, or is strewn across the globe to gather along coastlines, or collects, creating the great pacific garbage patch. The other day I was chatting with my 8 year old cousin and he asked me why plastic doesn’t biodegrade, since everything has to come from something natural from the Earth, right? Well yes, it does. But some things go through chemical processes that are difficult or impossible to undo. Think about a scrambled egg- it starts as a liquid, but once you cook it, you can’t unscramble it. It’s the same with plastics. They go through certain processes that make it impossible for them to fully breakdown and separate back into their original components. Instead, they simply break up into tinier and tinier pieces- remember the micro plastics? This is why most plastic can only ever be recycled once, maybe twice. After that, they still wind up as garbage. Additionally, most cities have pretty bad recycling policies. Instead of simply removing soiled items from recycling bins, the regulators mark the entire bin as contaminated, send it along with the landfill garbage, and move on. This means any bins with dirty pizza boxes, unrinsed milk cartons or bean cans, anything that isn’t up to standard, gets thrown in with the rest of the garbage. So yes, recycling is certainly a better option than throwing everything directly into the trash. But it is important to be vigilant with what you put in your recycling bin, so not to contaminate the whole thing. Learn more here.